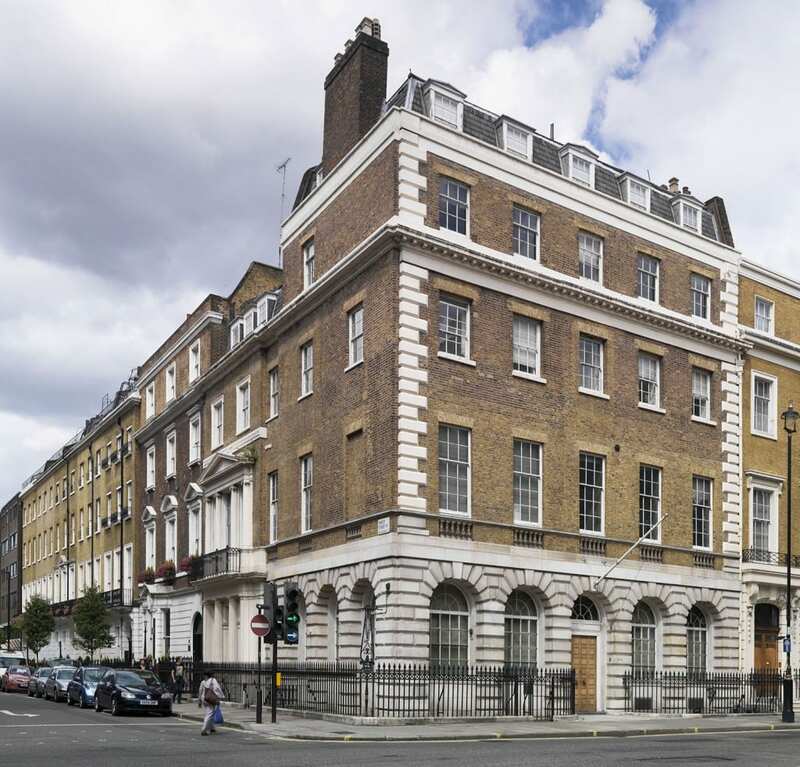 This is the fifth instalment in an occasional series of posts about Cavendish Square. 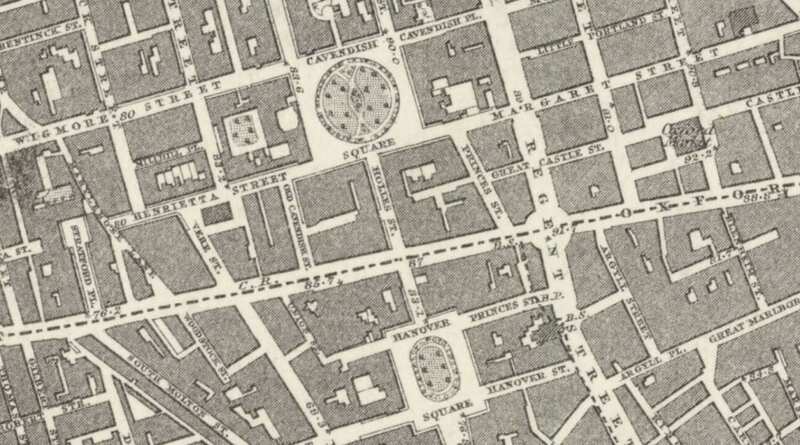 John Stewart’s Critical Observations on the Buildings and Improvements of London (1771) said of Cavendish Square that ‘the apparent intention here was to excite pastoral ideas in the mind; and this is endeavoured to be effected by cooping up a few frightened sheep within a wooden pailing; which, were it not for their sooty fleeces and meagre carcases, would be more apt to give the idea of a butcher’s pen’. 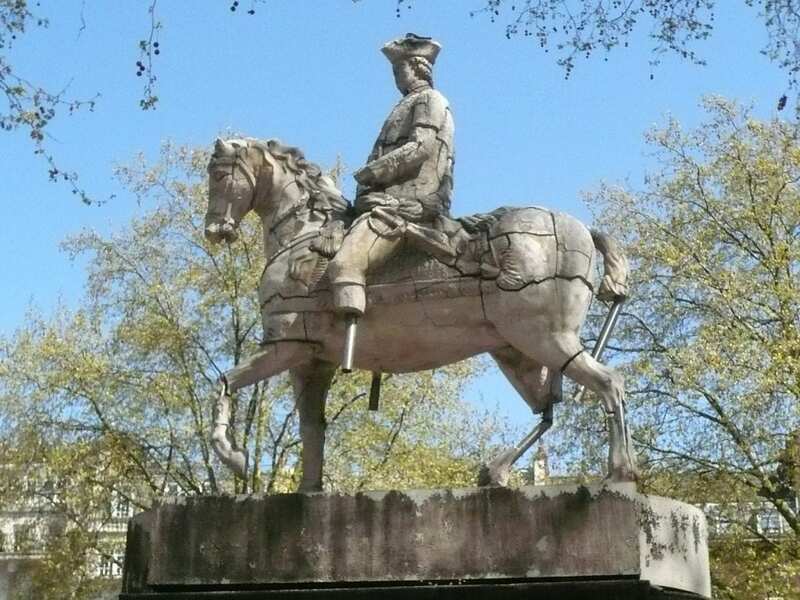 This was a satirical allusion to the square’s new statue of the Duke of Cumberland, the ‘Butcher of Culloden’, commander at that final and decisive defeat of the Jacobite rising in 1746. All the same, the square was indeed let to a butcher for grazing. 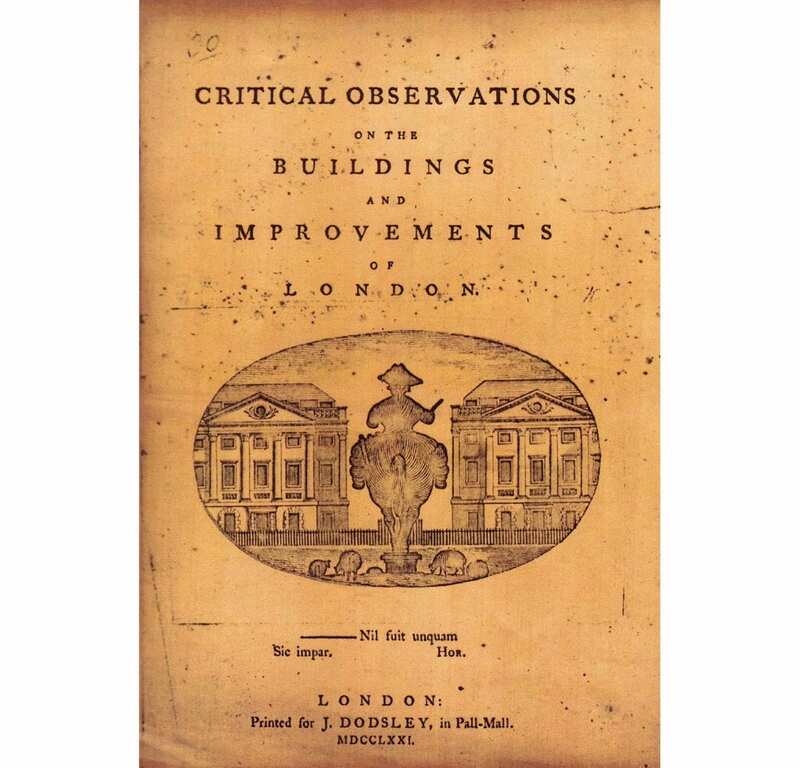 John Stewart’s Critical Observations, 1771. 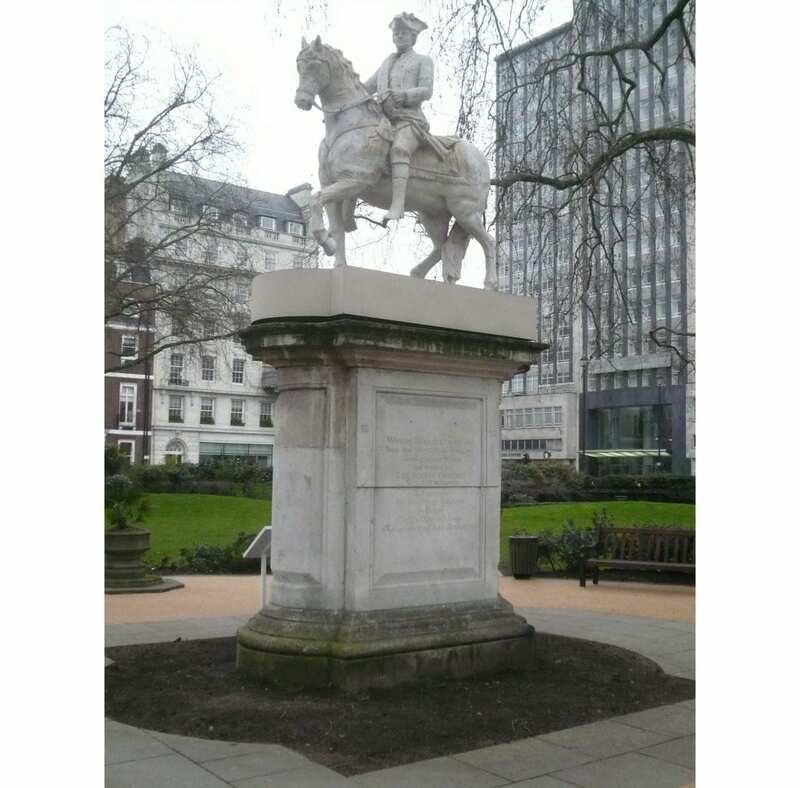 The gilt lead equestrian statue of the Duke of Cumberland had been erected in 1770 at the cost of Lt. Gen. William Strode, who had fought under and befriended the Duke, and whose own memorial in Westminster Abbey records him as ‘a strenuous assertor of Civil and Religious Liberty’. 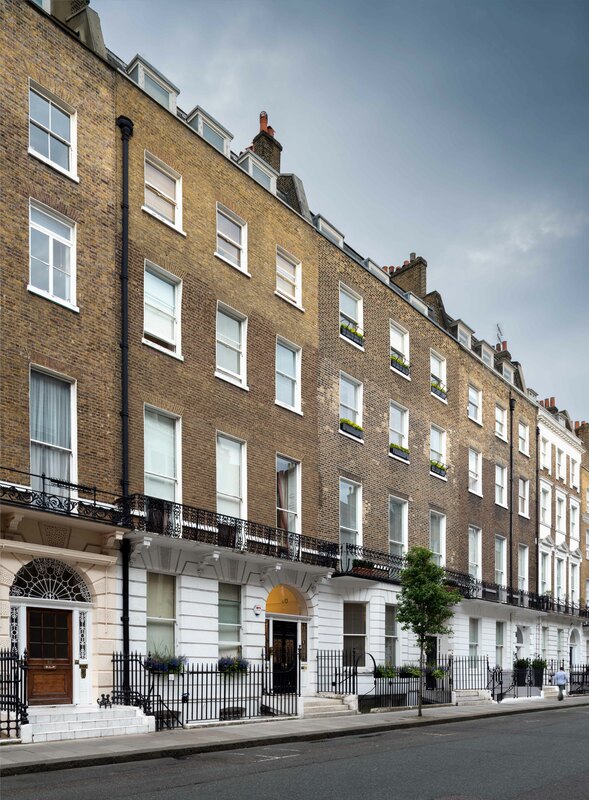 At the time Strode lived on Harley Street, on the north-east corner with Queen Anne Street. 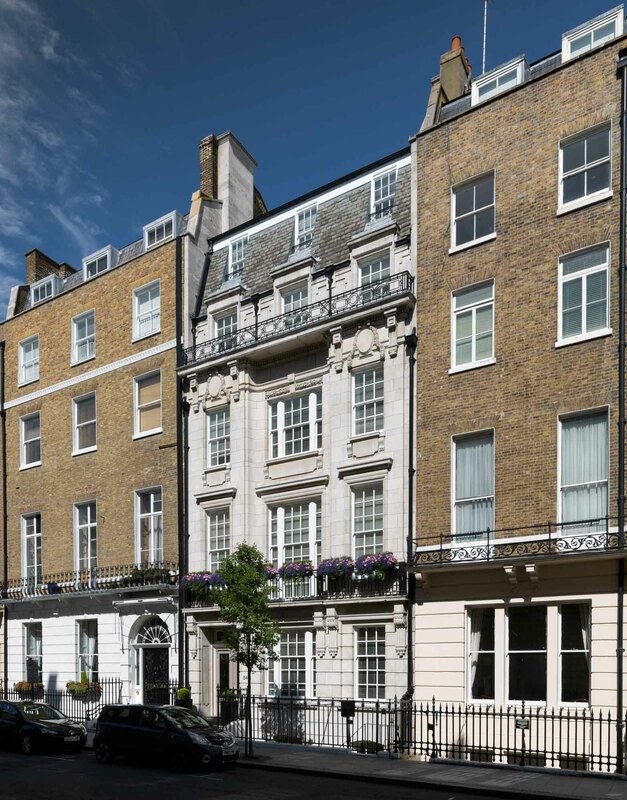 The Duke’s sister Amelia, who had paid for a lead statue of George III for Berkeley Square in 1766, lived at the west end of the north side of Cavendish Square. Strode conceived what was London’s first outdoor statue of a soldier in 1769, the same year he was alleged to have withheld clothing from his soldiers, a charge of which he was acquitted at a court martial in 1772. 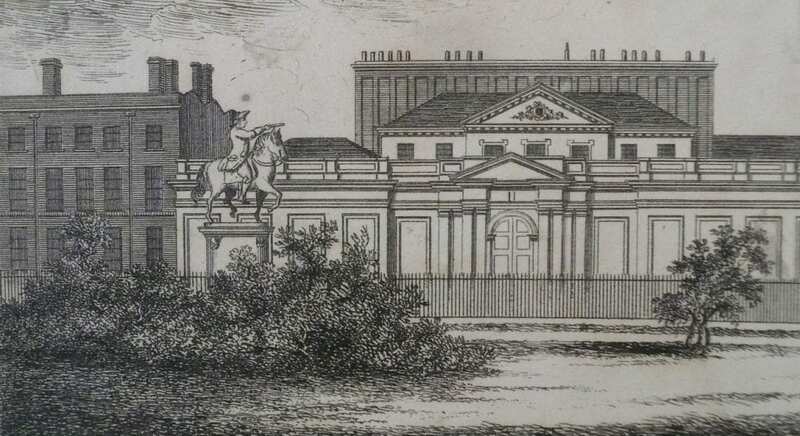 J. P. Malcolm’s engraving of 1808 (© City of Westminster Archives Centre). 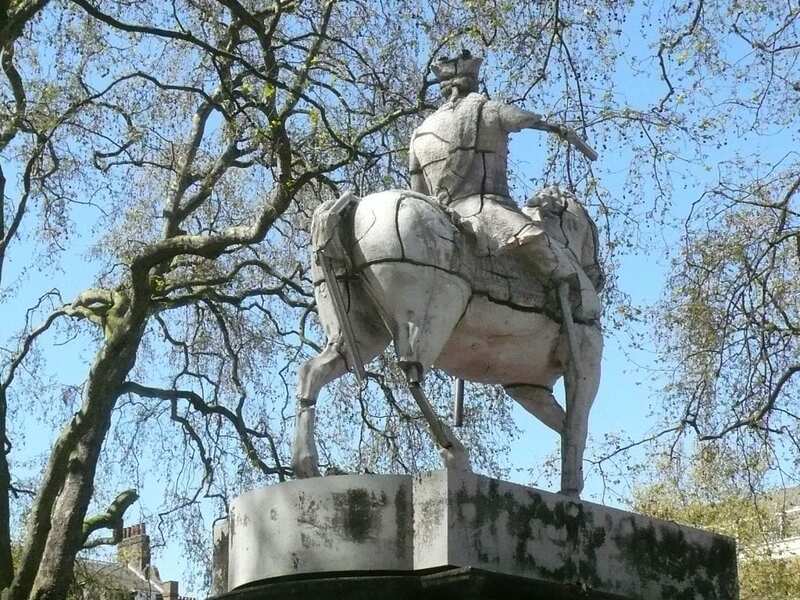 The statue was by John Cheere, who had made another version of Cumberland for Dublin in 1746. 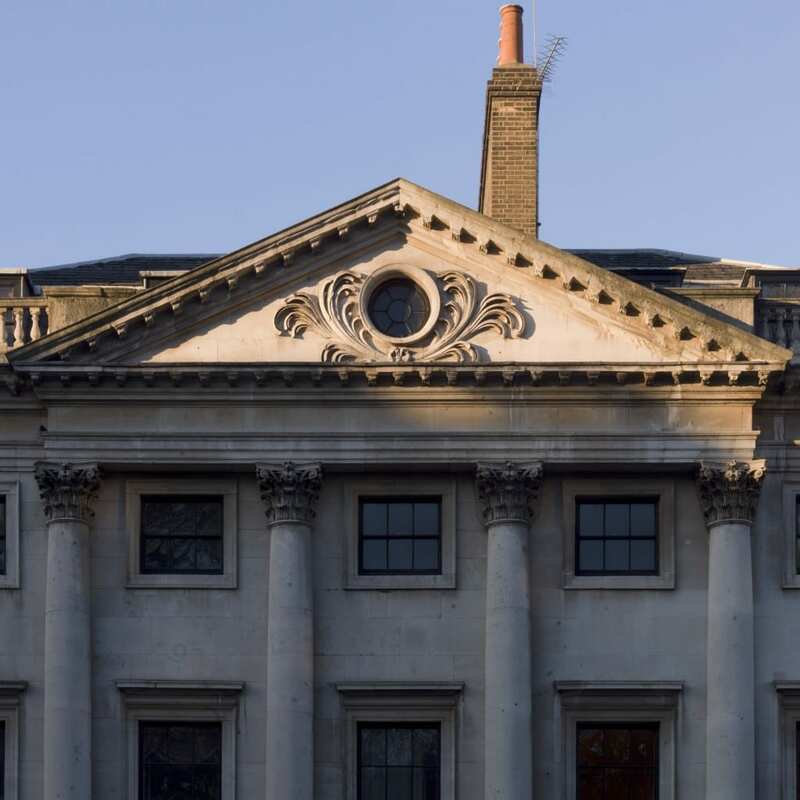 The paunchy figure in modern dress faced north to the contemporary temple fronts of what are now 11–14 Cavendish Square (see earlier post). 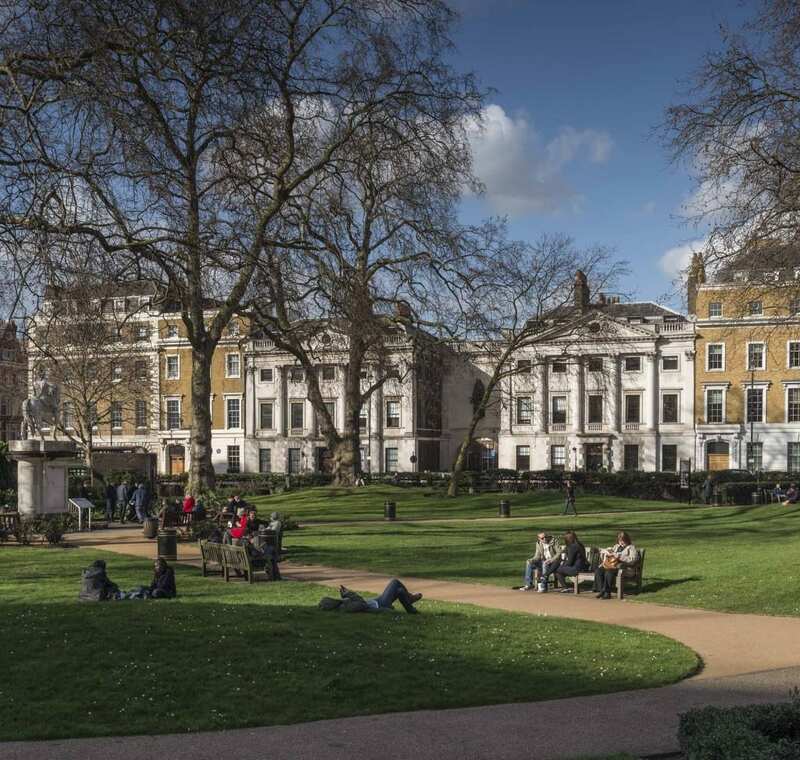 That the statue faced this way, presenting its rear to those who approached the square along the Hanover Square axis, may reflect where Princess Amelia and Strode lived. It also looked to Scotland. The statue was immediately ridiculed on aesthetic grounds; any politics in the gesture appear to have passed without published comment. Meekyoung Shin’s soap statue, photographed in 2013. Lacking admirers, the statue fell into dilapidation. In 1868 the 5th Duke of Portland took it down, ostensibly to be recast. 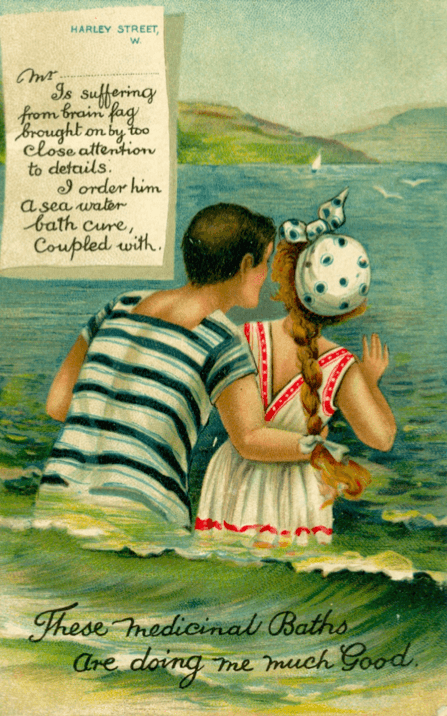 It never was, perhaps simply melted down instead. Its Portland stone plinth survived, with Strode’s inscribed dedication. 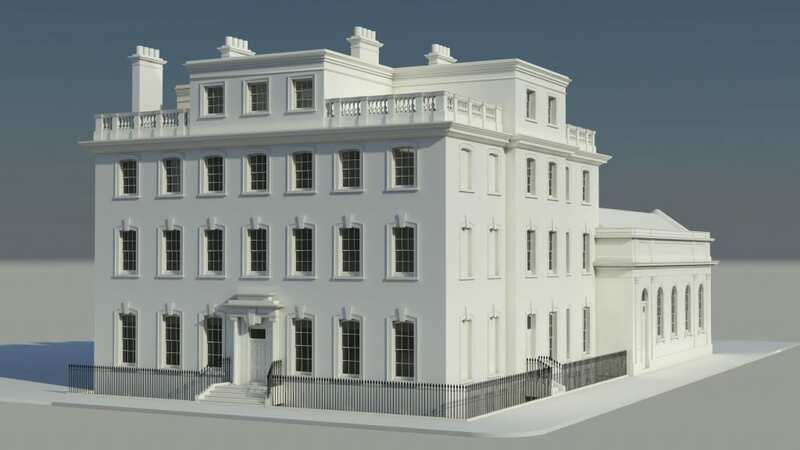 By 1916 this had been encircled by a roof on thin columns to create a summer house. That lasted into the 1970s. Meekyoung Shin’s soap statue in 2014 (© Historic England, Chris Redgrave). 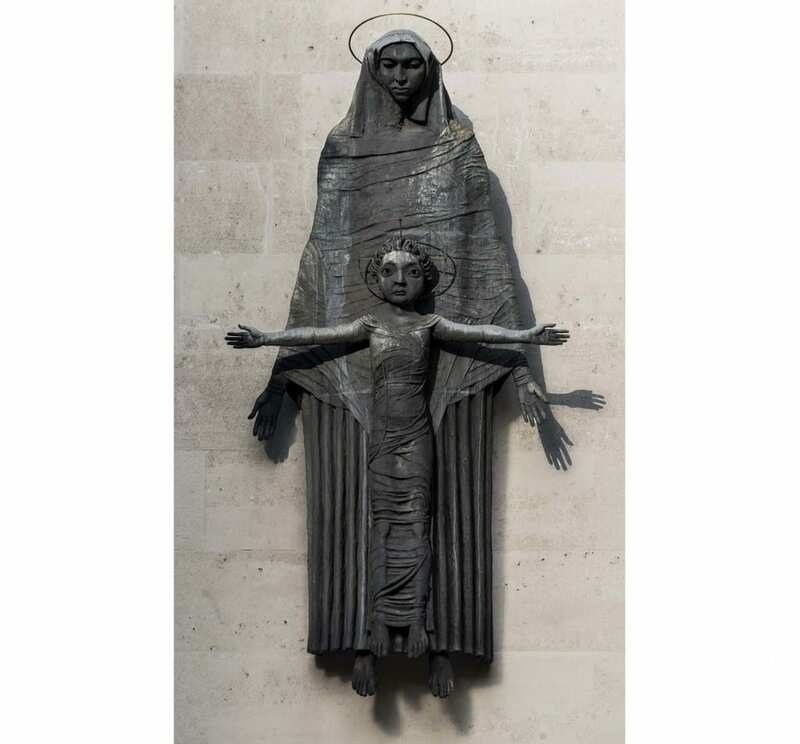 In 2012 a replica of the lost statue was mounted on the plinth, made of soap on a steel armature by the Korean artist Meekyoung Shin as Written in Soap: A Plinth Project. She anticipated its gradual and scented erosion within a year, but its tenure was extended, her commentary on mutable monumentality complicated by endurance and popularity. An identical replica was installed at the National Museum of Modern and Contemporary Art in Gwacheon, South Korea, in July 2013. 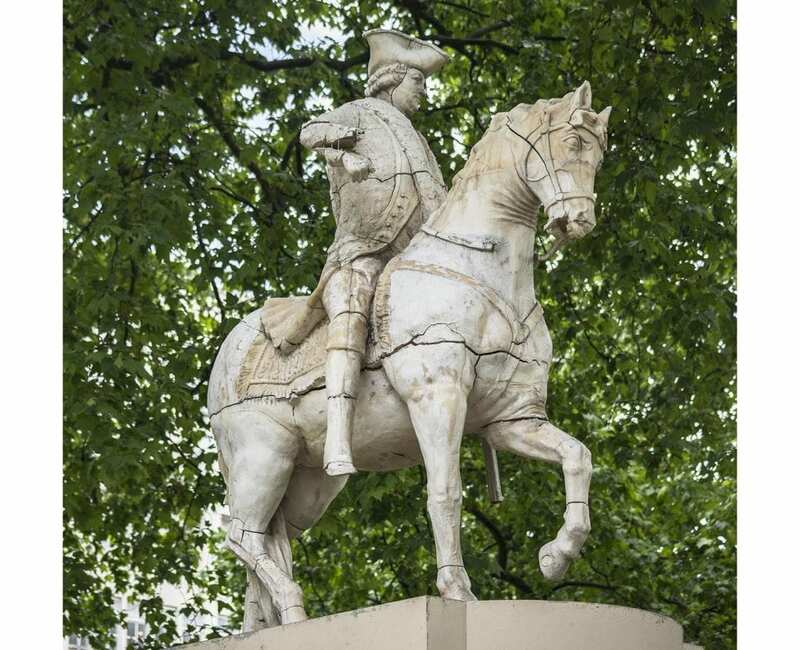 The Cavendish Square statue was dismantled in 2016. Meekyoung Shin’s soap statue in 2015 (above and below). 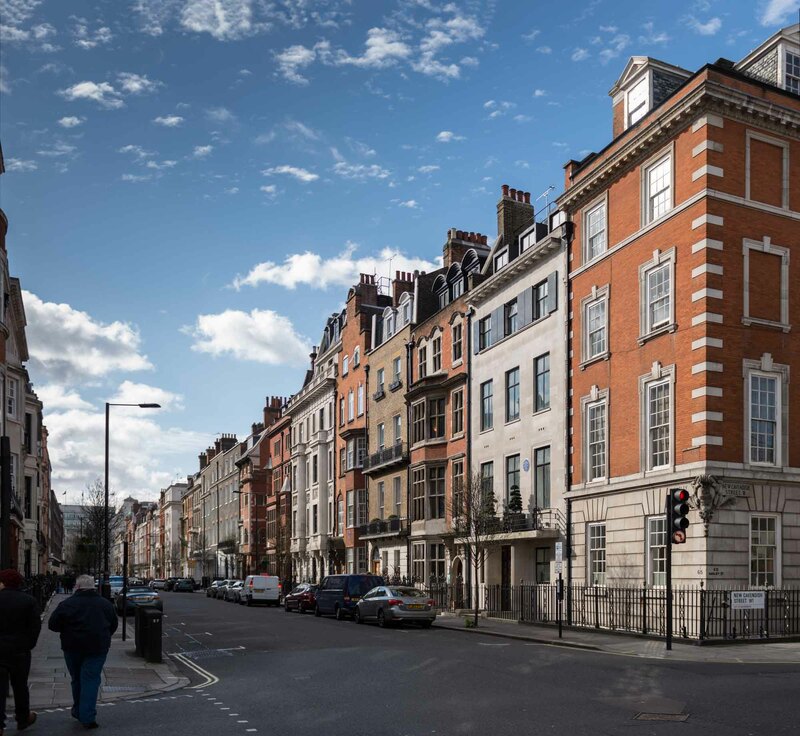 This is the fourth instalment in an occasional series of posts about Cavendish Square. 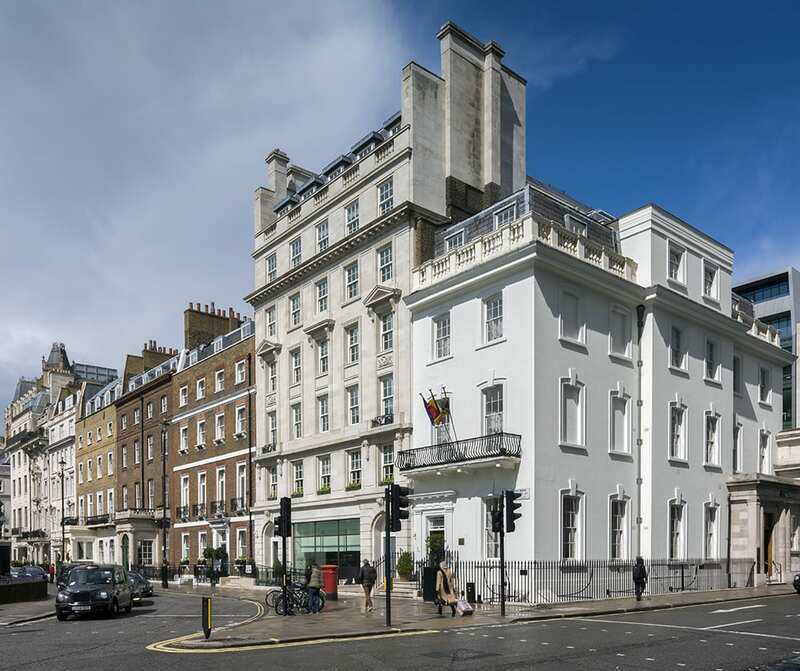 Outward appearance belies the fact that there is a substantial early Georgian house at 20 Cavendish Square. 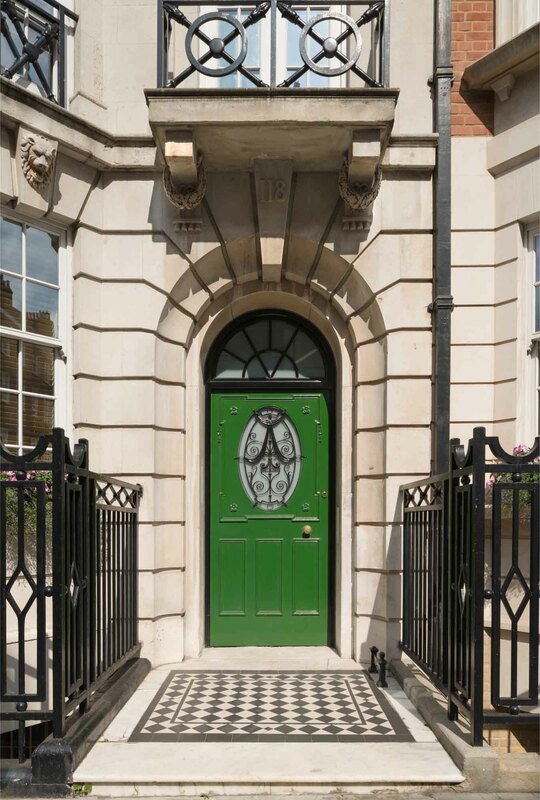 It is enclosed within a shell of the 1930s that was part of an extensive redevelopment of a larger corner site as premises dedicated to the nursing profession. 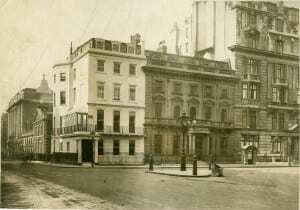 20 Cavendish Square (to centre), c.1910 (Royal College of Nursing Archives). 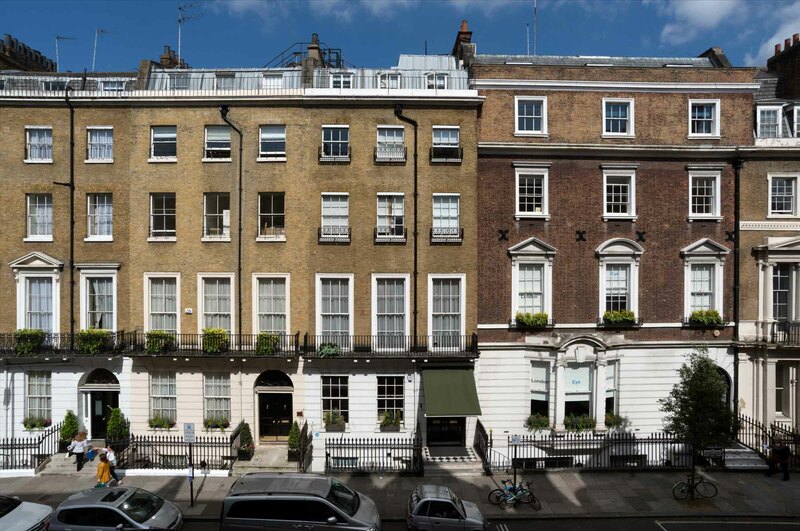 The plain brick-fronted three-storey house was built in 1727–9 by George Greaves, a Clerkenwell carpenter. 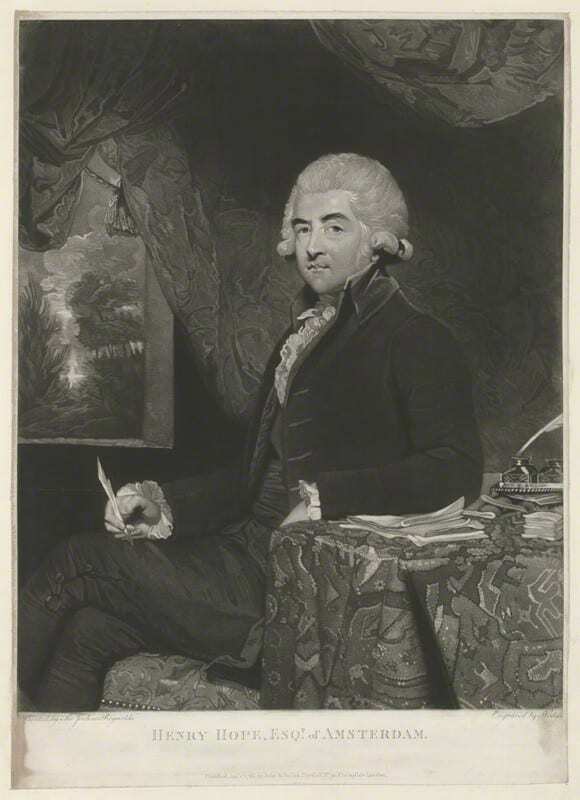 Its first resident was Francis Shepheard, a former MP who had moved from the Whigs to the Harleyite Tories. 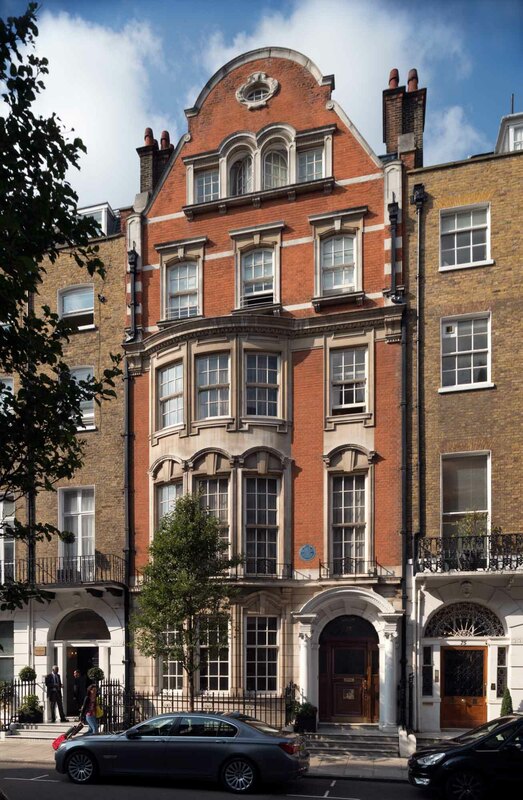 He was a wine trader and East India merchant in the steps of his father Samuel, who had been Robert Harley’s financier and was Deputy Governor of the South Sea Company from 1713. 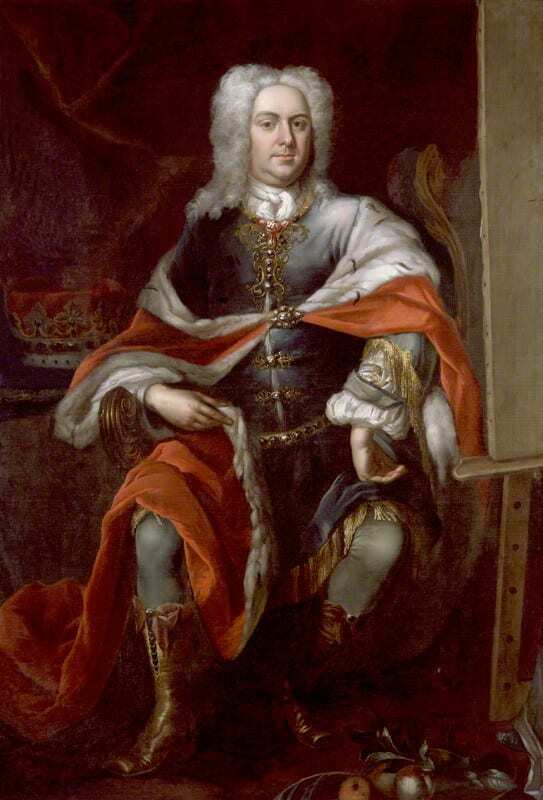 Francis inherited a fortune when his father died in 1719. Plans of the ground floor and first floor of 20 Cavendish Square, showing the layout of the eighteenth-century house and later extensions of 1921-6 (© Survey of London, Helen Jones) Please click here to download a pdf version of the plans. 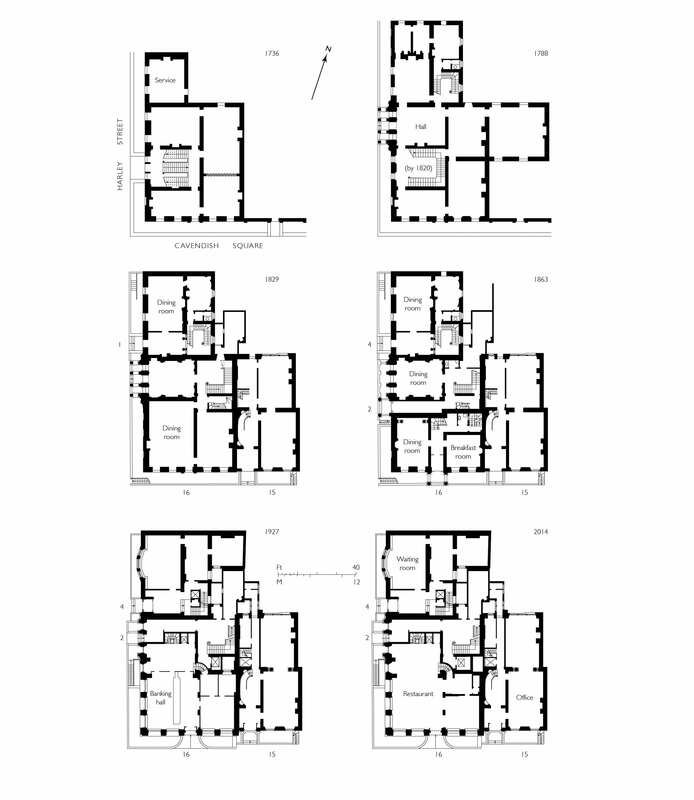 A broad five-bay front permitted a central entrance, but in an almost square plan there is an unusual layout. 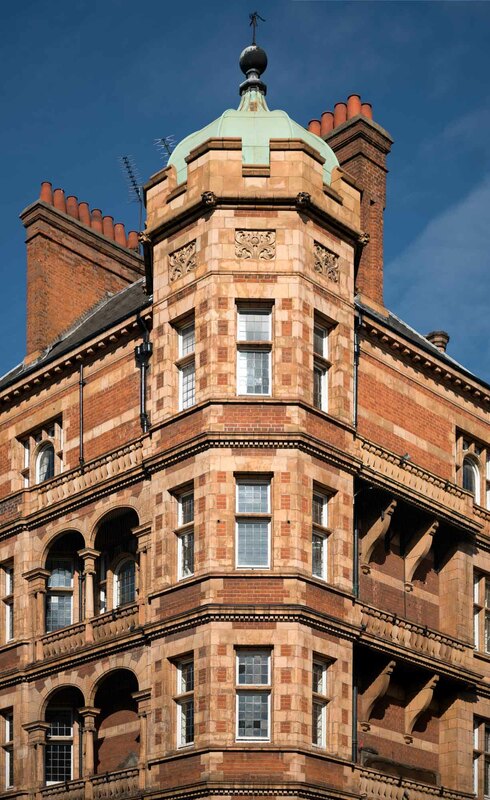 The house’s finest feature, a painted staircase, among the best of its kind in London, is oddly situated in the south-east corner. The great expense of such decoration may have obliged Shepheard to avoid an open-well entrance-hall form in favour of a dog-leg stair walled off from the entrance hall. This meant orienting the stair to rise from back to front, forcing a landing against the front wall and so causing irregular fenestration. 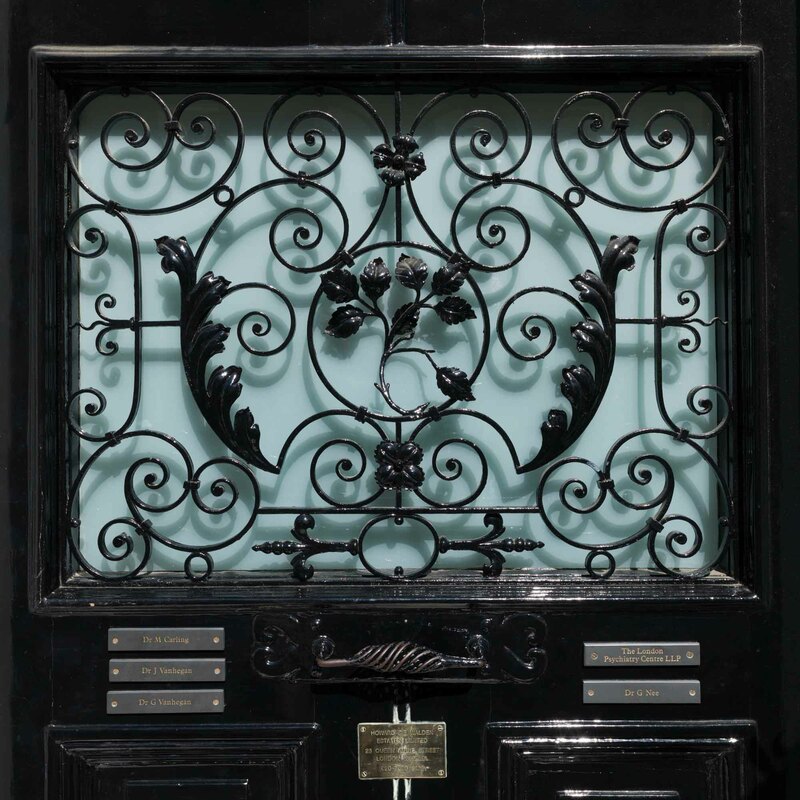 The town-house aesthetic was evidently, and even more than usual, internal. 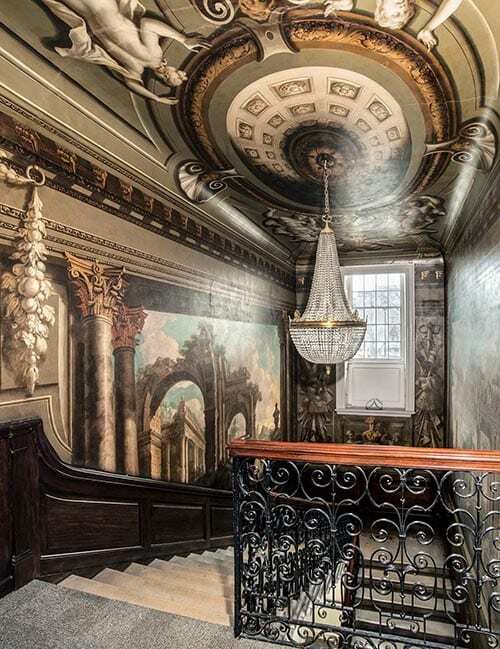 The main staircase walls display two large architectural capricci, attributed by Edward Croft-Murray to John Devoto, the principal scene painter at the Drury Lane Theatre at the time. 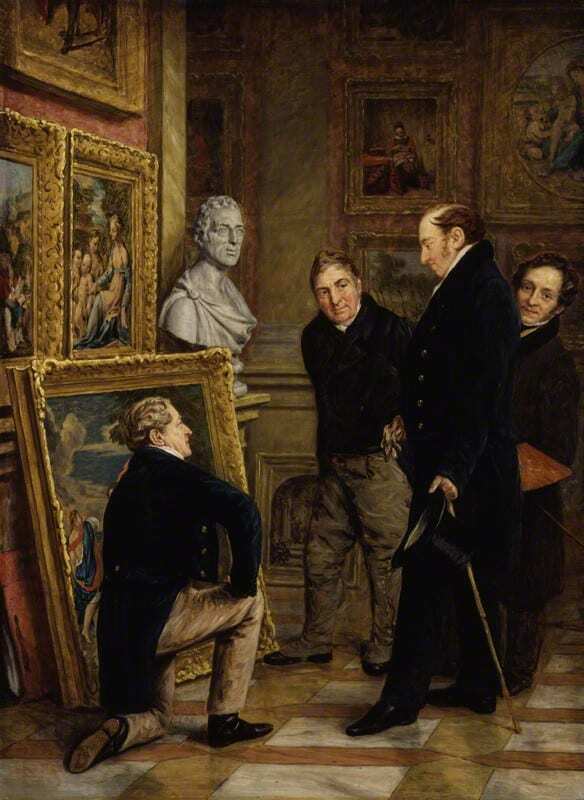 There are also trophies and grisaille figures of the Arts on the landing and of Music below the southern capriccio, these more in the style of James Thornhill. The ceiling, in contrast, is painted in the manner of William Kent, with gilded hatching and grisaille caryatids supporting a trompe-l’oeil dome. 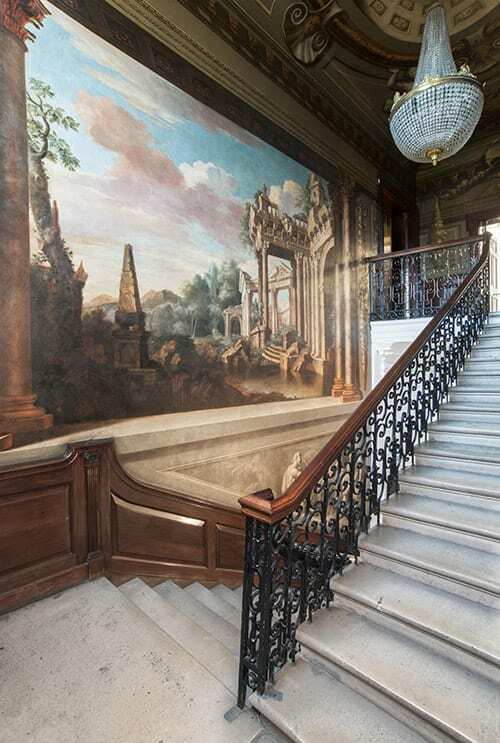 View of the painted staircase at 20 Cavendish Square, showing the southern capriccio attributed to John Devoto (© Historic England, Chris Redgrave). View of the painted staircase at 20 Cavendish Square, looking north-east from the first-floor landing (© Historic England, Chris Redgrave). 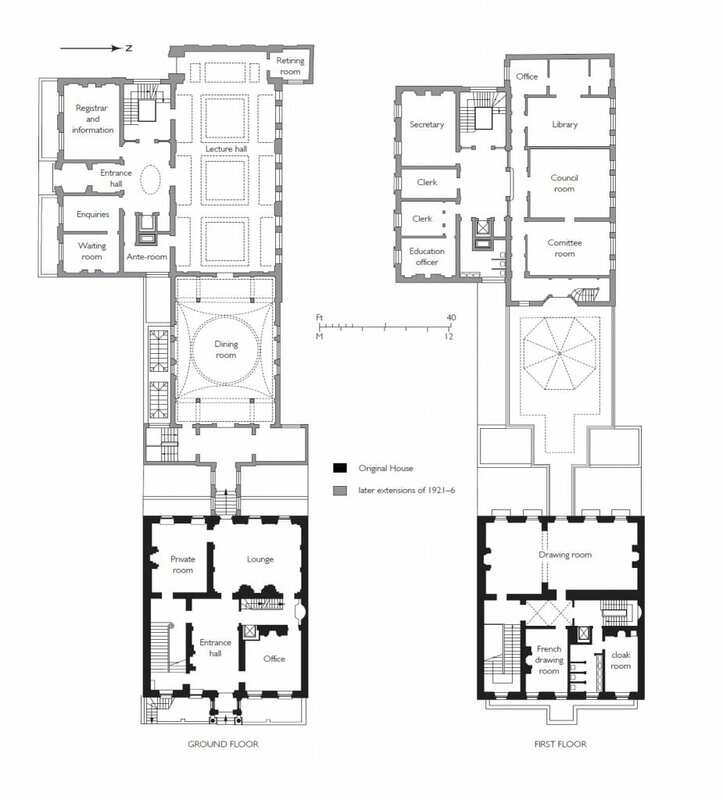 The next most impressive space in the house, to the north-west on the ground floor, is a fully pilastered room. The quality of this room, and the fact that its Ionic pilasters are sunk at the corners, hint at involvement on the part of James Gibbs, who was stationed just around the corner on Henrietta Street at the time. An imposing marble chimneypiece has a swagged frieze with a Medusa-like mask, plaits tied under her chin, a type widespread in the 1730s. 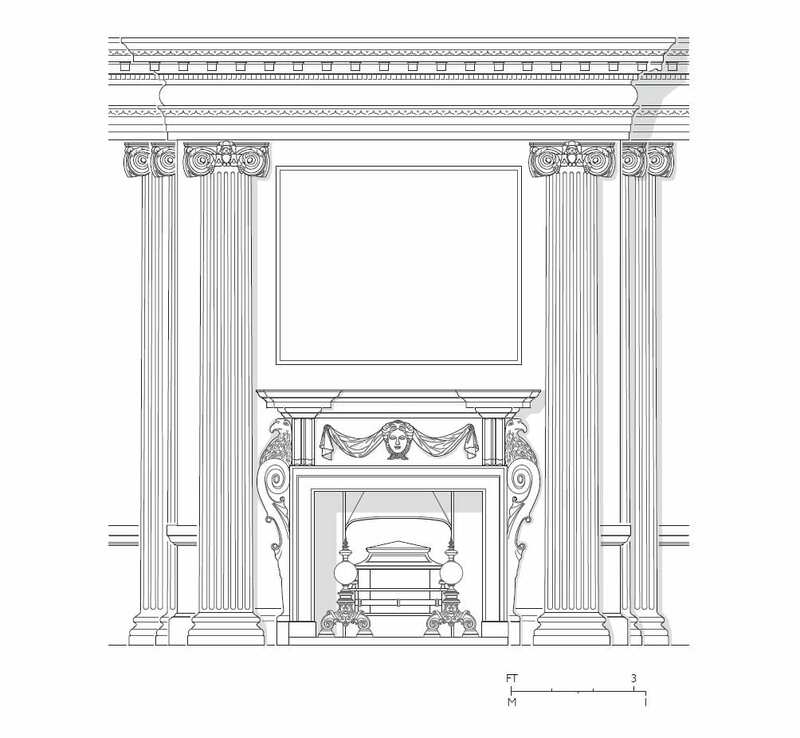 However, flanking eagle-headed terms suggest the fireplace could be datable to the 1750s as double-headed eagles featured in the coat of arms of William Wildman Barrington, 2nd Viscount Barrington. 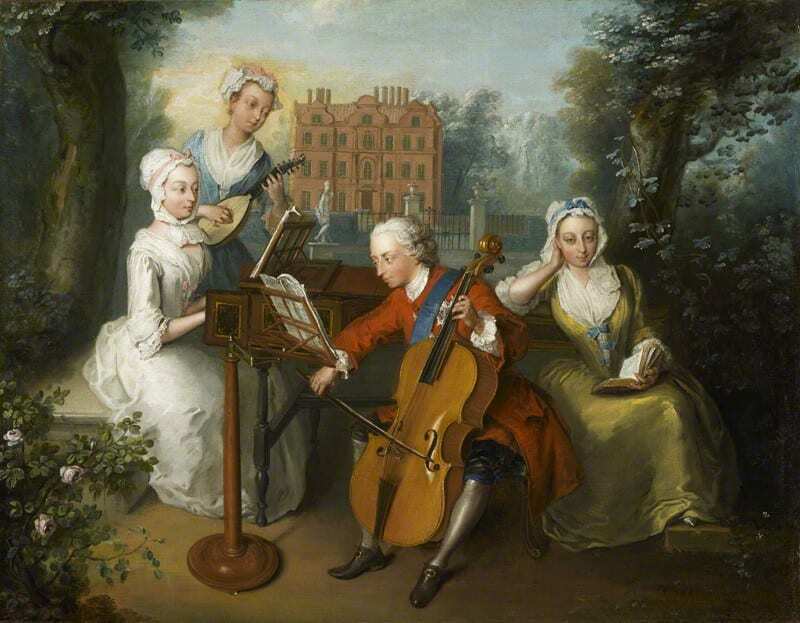 He moved in when he became Secretary at War in 1755. During his tenure the house became known as a place for parties. The Barrington family continued to occupy the house up to 1888. 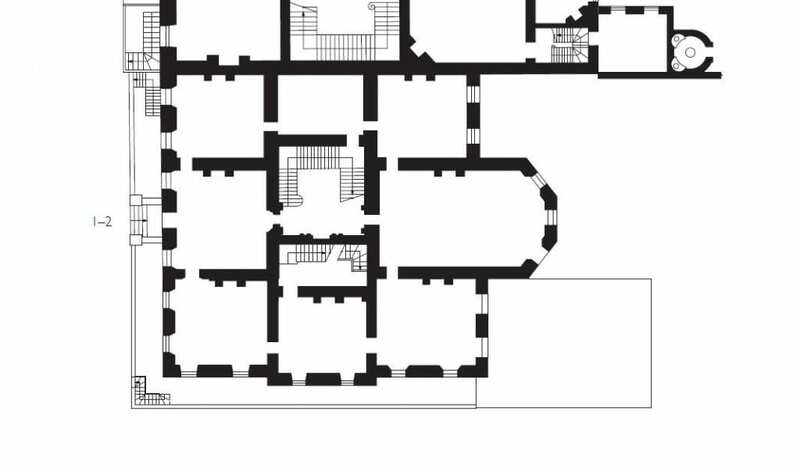 Measured drawing of the central part of the east side of the pilastered room (marked lounge on the plan) at 20 Cavendish Square (© Survey of London, Helen Jones). 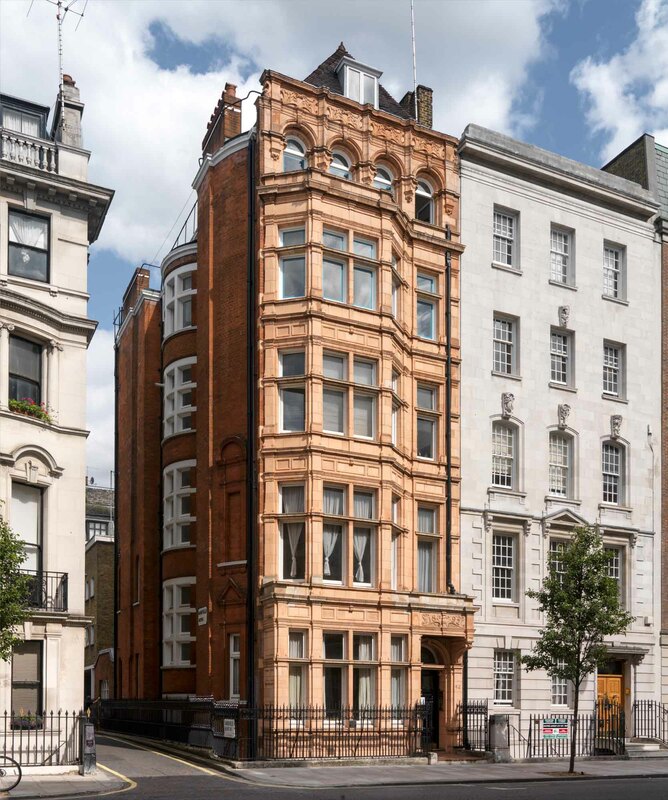 In 1894 Sir Charles Tennant bought the property as a wedding present for his daughter, Margot, and the Liberal politician Herbert Henry Asquith. The couple lived here with their children and servants before and after Asquith served as Prime Minister from 1908 to 1916. Margot Asquith was a political hostess with a reputation for extravagance. On departing for 10 Downing Street she noted, ‘All the colour, furniture, grates, curtains, and every chair, table, and rug in Cavendish Square I had chosen myself.’ This precedes the disarming admission that ‘It is a constant source of surprise to people of moderate means to observe how little a big fortune contributes to Beauty.’ (The autobiography of Margot Asquith, ii, 1922, pp.103 and 106) After their wartime return, their income much diminished, the Asquiths were obliged to sell in 1920, marketing the property as suitable for ‘a nobleman, embassy or family of distinction’ (Royal College of Nursing Archives, RCN/28/3). 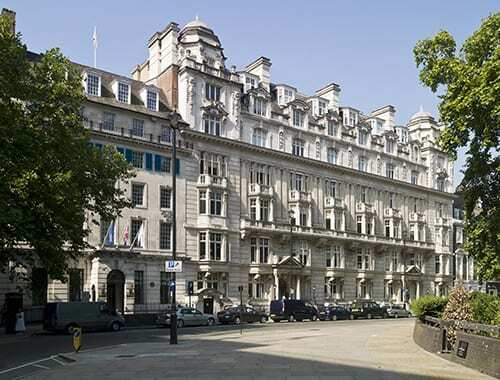 But Annie Pearson, Viscountess Cowdray, bought 20 Cavendish Square to be a clubhouse for nurses. She followed up in 1921–2 by funding rebuilding along Henrietta Street to form a headquarters building for the College of Nursing, established in 1916 in an office on Vere Street as a response to wartime exigencies, to support and advance the nursing profession. 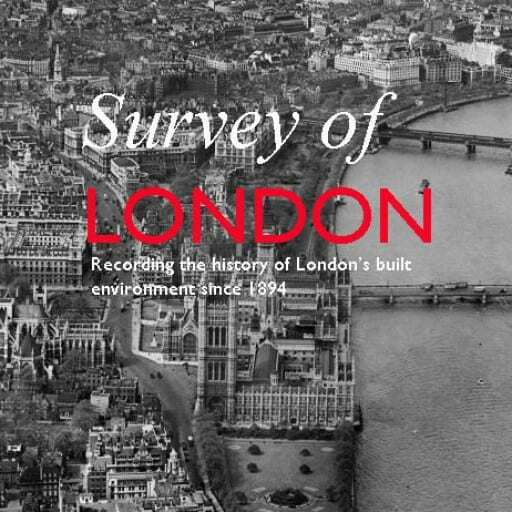 This was part of a phased campaign of redevelopment with Sir Edwin Cooper as architect throughout. 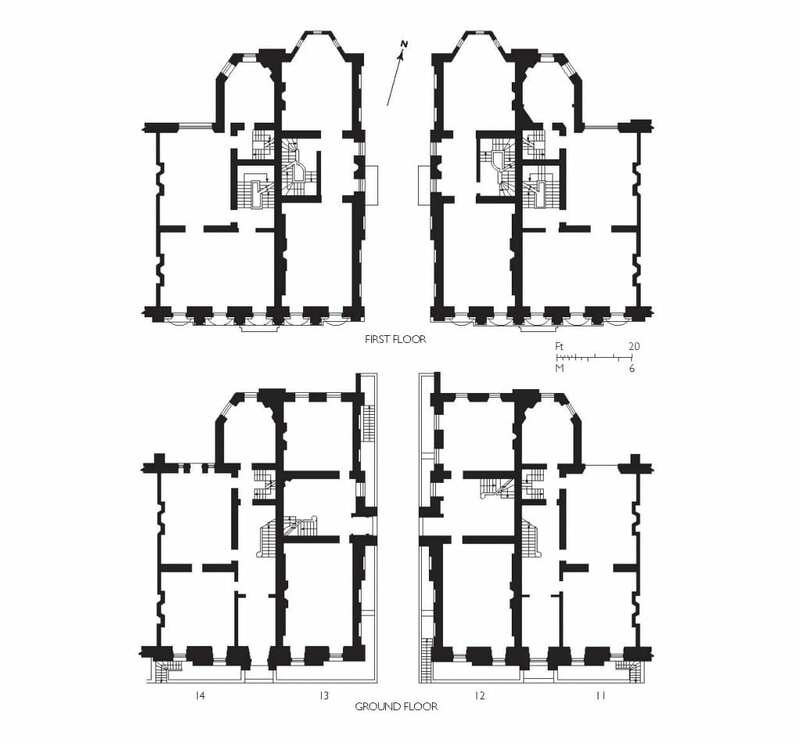 The first phase included some internal remodelling of the house; Cooper’s neo-Georgian detailing is hard to distinguish from the eighteenth-century work. 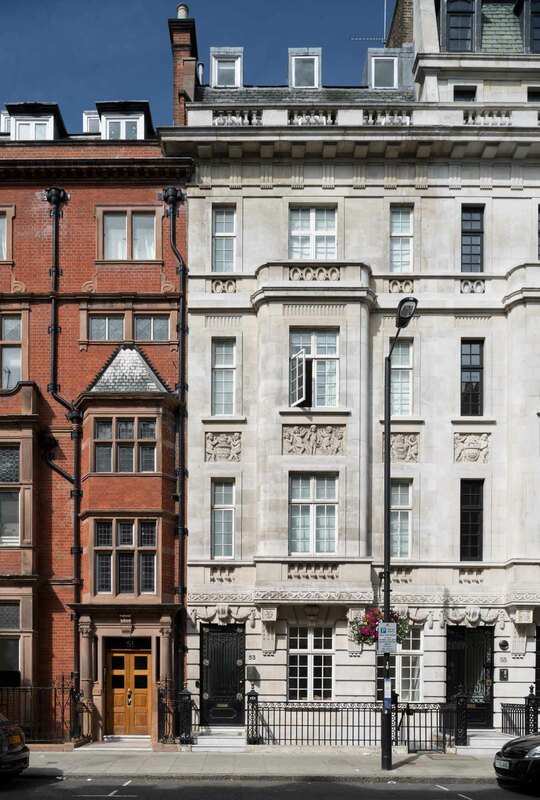 20 Cavendish Square (left), as refaced and raised in 1932-4 (© Historic England, Chris Redgrave). The last rebuilding phase in 1932–4 followed the acquisition and demolition of a corner house. Cooper refaced and, through the ingenious introduction of bridging structural steelwork, heightened No. 20, which was used as the Cowdray Club up to 1974. 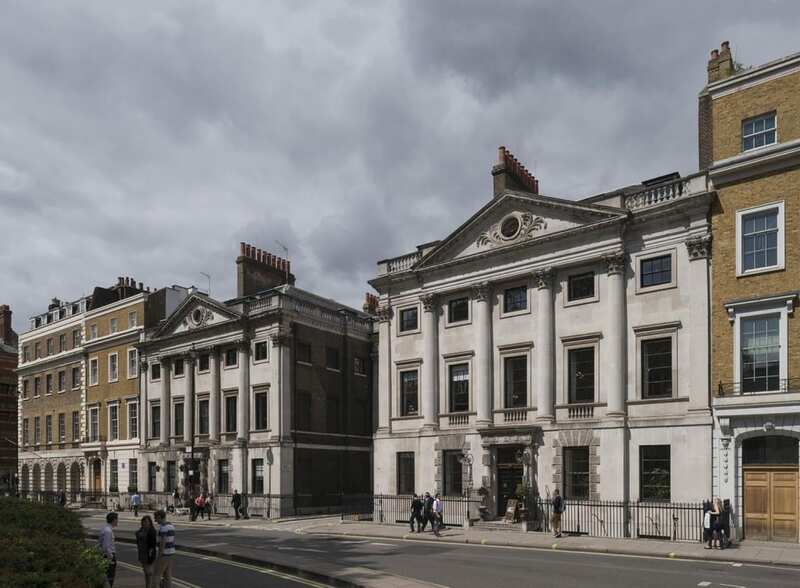 The RCN has since carried out three refurbishments, the most recent of which in 2012–13 saw the opening on Henrietta Street of a public heritage centre with retail and museum elements.